As part of my hobby resolution to get back to working on projects that inspire me, and inspired in no small part by Bryan's #thecultrises effort, I have started working on a pet project that has been gestating in my brain since Genestealer Cults were first released a couple years ago. Specifically, I want to do my Genestealer Cult as a bit of a mashup with Adeptus Mechanicus and Skitarii. 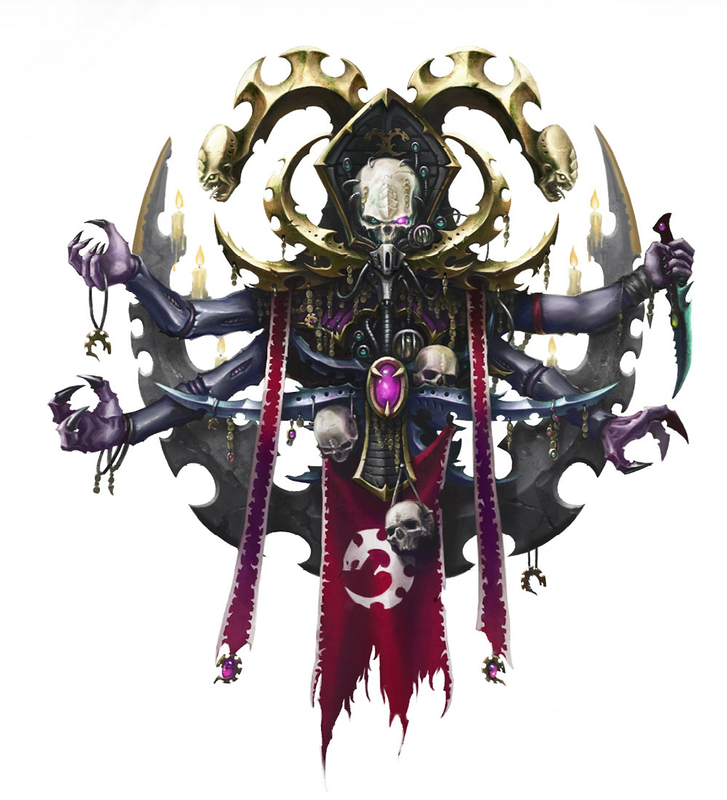 The idea, fluff wise, is that a Genestealer Cult has infiltrated a forge world and the leadership of the Cult Mechanicus that runs the planet itself. Aesthetically, they tie in to me just with their tendency to be human-like, but with extra limbs and other enhancements for both work and combat. I actually started this project a while ago, and set up a handful of mashups of Neophytes and Skitarii. However, at the time, I didn't fully assemble them, thinking I might want to paint them in sub assemblies. 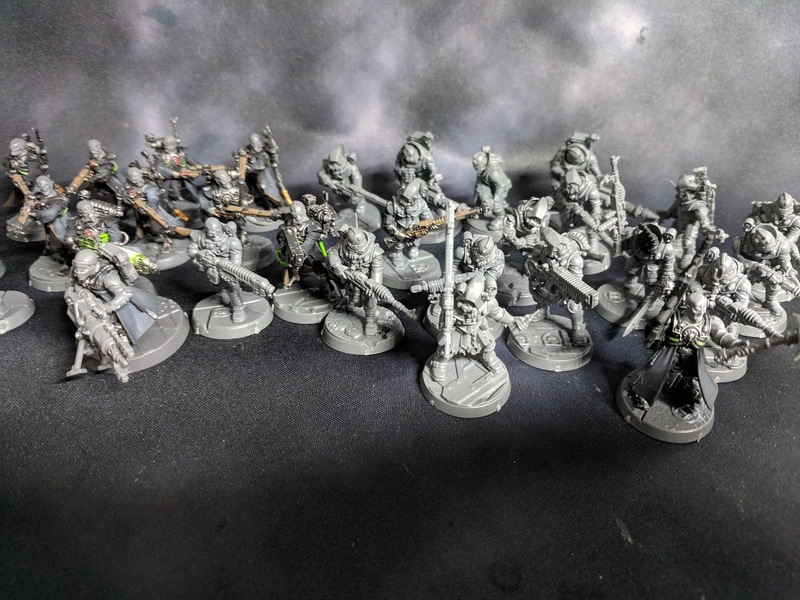 While there is some merit to that, at the end of the day, these are cheap infantry and there will be a lot of them; waiting to fully assemble them could be a bit maddening trying to keep everything straight, for a minimal return of being better able to paint parts of the model that will be obscured. With that in mind, this time around I've decided to just go for it and put the models together. 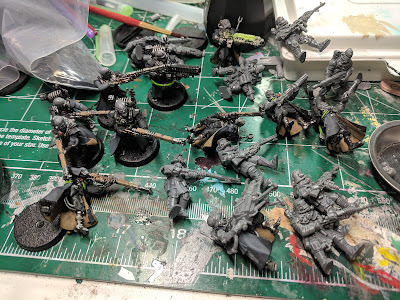 I have a bunch of Skitarii and a couple boxes of Neophytes, plus the Neophytes from the original Overkill release. For the most part, I'm opting to use the Ranger and Vanguard guns as the base equipment, as I think both are more acceptable as Autogun / Lasgun equivalents than using Lasguns and Autoguns as the Skitarii weapons. The general formula I'm using is the body from one kit and the head from the other, with mostly Skitarii weapons and arms. 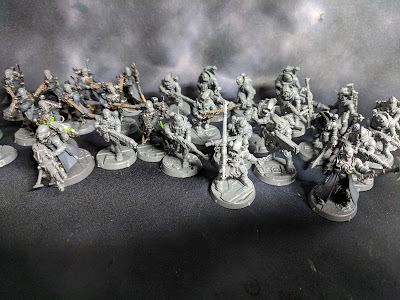 For this first batch, I'm looking to have about 30 Neophytes done with the skitarii rifles / carbines, and a further 15 with the various special weapons. 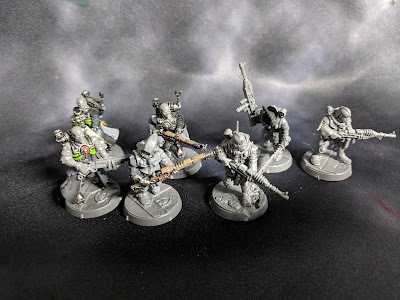 From the Skitarii perspective I'm aiming for about a 1:2 split of Vanguard to Rangers. I'll also probably end up with about a 50/50 split of Neophyte bodies with Skitarii heads to Neophyte heads on Skitarii bodies. My plan is to finish assembly on this batch by next week, as well as putting together a couple character conversions I've had bouncing around in my head for nearly as long as this concept as a whole. Hopefully next week I'll have something to actually show, rather than vague teasing. In the mean time, what projects are you guys working on? Share in the comments below, in an email, or to our Facebook page.